A clothing firm has removed "tactical wear" utility jackets from its stores after a youth worker said they may be mistaken for stab vests. 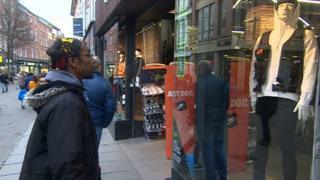 Damien Henry said he was "appalled" when he saw a jacket in the window of Footasylum in Nottingham. Footasylum said it was "popular contemporary fashion" but, due to "misunderstanding around this product", it has withdrawn the item. Mr Henry said he believed the move could help save lives. Image caption "Utility vests" are sold by several fashion chains but this design was described as "tactical wear" from the "military collection"
Mr Henry said he works with young people who have been stabbed or shot, and who are involved in gangs. He said: "A child won't look at that and think, 'Oh that's just a fashion item'. They might look at it and think, 'That looks nice. That looks like a stab-proof vest or a bulletproof vest'." He added that he was concerned that if a child wore it in an area where there were gangs, the youngster could be putting themselves in danger. "Before they know it, they stab him." A Footasylum spokesman said it stocked a range of utility vests, as do a number of other fashion retailers. He said: "This is a highly popular contemporary fashion item that is not intended to bear any relation to violent or criminal activity of any kind. "However, in light of the misunderstanding around this product, we have taken the decision to withdraw it from sale for the foreseeable future."